Tanque de asalto pesado. Diseñado sobre la base del KV-1 en enero de 1940, con un total de 334 vehículos fabricados desde 1940 hasta 1941. Los tanques KV-2 entraron en acción en 1941, con la mayoría de los vehículos perdidos en el mismo año. The KV-2 is the most fun tank out of all Tier 6 tanks in the game, in the hands of the skilled player. With very high profile, huge but thin turret and the hull of the KV-1 that is useless against Tier 7s and 8s make it not the best frontline pushing tank. However, the excellent 152mm has excellent damage, capable of dealing 500-700 damage within one shot on even Tier 8 tanks (if you use HE shells). The long reload is annoying, so make sure you place your shots well. 107mm has a decent reload but isn't as outstanding as 152mm. You may want to use it if you do not like "troll guns" with inconsistent damage (sometimes you might hit only 50-80 damage if you are unlucky, but 200-500 is average damage against higher tiers). When the Soviets entered the Winter War, the KV was among the tanks sent to be tested in combat conditions. The KV outperformed others. It's heavy armor proved highly resistant to Finnish anti-tank weapons, making it more difficult to stop. 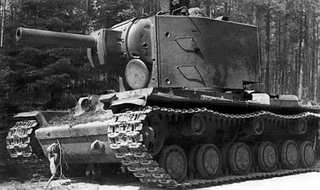 However, the Soviets found it difficult to deal with the concrete bunkers used by the Finns and a request was made for a tank with a large howitzer. One of the rush projects to meet the request put the howitzer in a new turret on one of the KV tanks. The 152 mm howitzer one as KV-2 Heavy Artillery Tank. 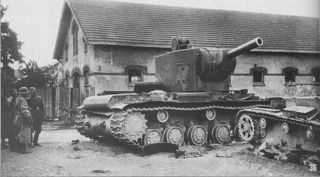 On June 24, a single KV-2 heavy tank, at a crossroads in front of Raseiniai, managed to cut off elements of the 6th Panzer Division which had established bridgeheads on the Dubysa. It stalled the Division's advance for a full day while being attacked by a variety of antitank weapons, until it finally ran out of ammunition. When production shifted to the Ural Mountains 'Tankograd' complex, the KV-2 was dropped. While impressive on paper, it had been designed as a slow-moving bunker-buster. It was less useful in highly mobile, fluid warfare that developed in World War II. The turret was so heavy it was difficult to traverse on uneven terrain. Finally, it was expensive to produce. Only about 300 KV-2s were made, all in 1940-41.